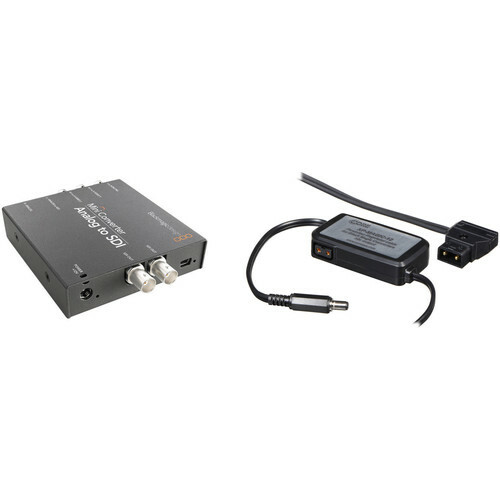 The B&H Analog to SDI Converter with P-Tap Adapter Cable Kit combines Blackmagic Design's mini analog-to-digital converter with a P-Tap power adapter. This allows you to power the converter and any Switronix 12V accessories using a PRO-X series lithium-ion battery, making for a more efficient and compact camera rig. Use this device to convert analog video sources to SDI video output. This unit can embed SDI audio from balanced AES/EBU or analog audio inputs. The Core SWX Powertap BlackMagic Converter Cable (24") comes with a regulated 12V connector jack to power the Black Magic Mini Converter with an inline female P-Tap connector for 12VDC, and features both red and green LED indicators to display battery power status. It can be used with a Core SWX accessory or individually with a PRO-X series Lithium Ion battery, and is housed in an enclosure. Box Dimensions (LxWxH) 5.6 x 5.4 x 2.6"
Box Dimensions (LxWxH) 5.7 x 3.4 x 2.15"